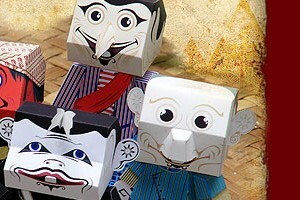 Beautiful Barong papertoy designed by Faisal Azad (Fai Salazad - Indonesia) for Paper Replika. Fai is one of the well known papertoy designers around. 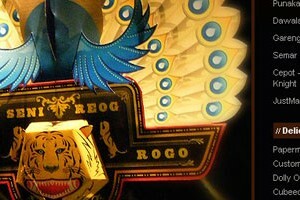 Some of his works were displayed on recent 2009 papertoy exhibition on Minneapolis Art Gallery, USA. 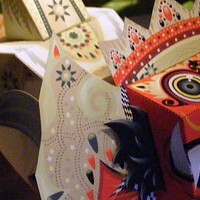 He frequently captured the beauty of Indonesian culture in papertoy design. Reog Ponorogo is a folk dance with 25-40 dancers staged full moon nightly in paseban, Ponorogo Town Square. 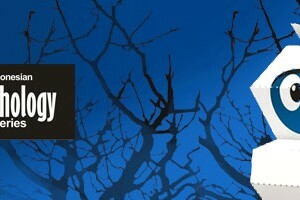 Tells about the palace of queen Kediri kingdom. On the way from Bantarangin kingdom to Kediri, Singbarong as leader conquered tigers and peacocks. The prima dancer wearing mask from peacock leather with the tiger head and it weight is between 40 to 50 kg and is manly supported by mouthstrap clenched in the dancers teeth. The most important thing to notice, that the dance was from Ponorogo, East Java - INDONESIA. In Wayang, the ksatria of Pandawa, especially Arjuna was always accompanied by their loyal servants clown, by the name of Punokawan. Semar and his sons Gareng, Dawala and Cepot are the servants of kings and ksatrias with good behavior fighting for the truth. Togog and Bilung, on the contrary are serving bad rulers and knights. Although they are only servants with ugly faces and disproportional bodies, but they are very wise and good advisers.